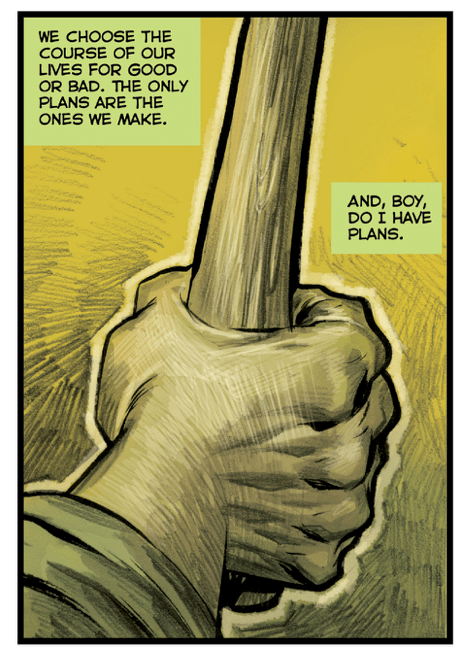 The tale of Big Man Plans is one of harsh realities and over-the-top violence. At its heart lies the beginnings of a revenge story, though at the end of issue #1, the reader is left to wonder what the main character’s real motivations are. A mysterious letter is the impetus, though what exactly it contains is for now, left to the imagination. 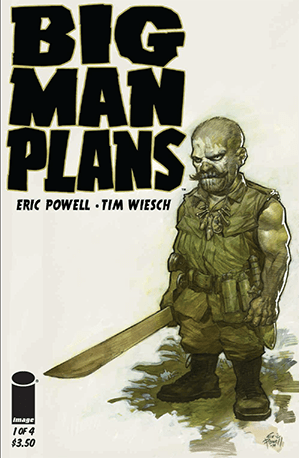 This four-issue series by Eric Powell and Tim Weisch takes a man of small stature and follows him from his difficult farm-boy upbringing to his initiation into a secret Vietnam War program and his struggles dealing with life as a returning postwar vet. For all of the comic’s excess, it has some tender moments, in which I couldn’t help but empathize with “Big Man,” as the title character is so ironically—yet aptly—named. His story mirrors that of others born with physical challenges who have been bullied and ostracized for being different. Although the overall feel of this book is extreme, for me, there is much to relate to emotionally here. Who of us hasn’t at one time or another felt alone in our struggles, like the world was against us and reaching the breaking point, considered striking back at the ones who have hurt us most? Revenge fantasies while enticing to imagine on paper, rarely turn out in real life in the way one might hope or expect. I can’t help but think this story will get worse before it gets better. So in that way it is a slice of all-too-real life. 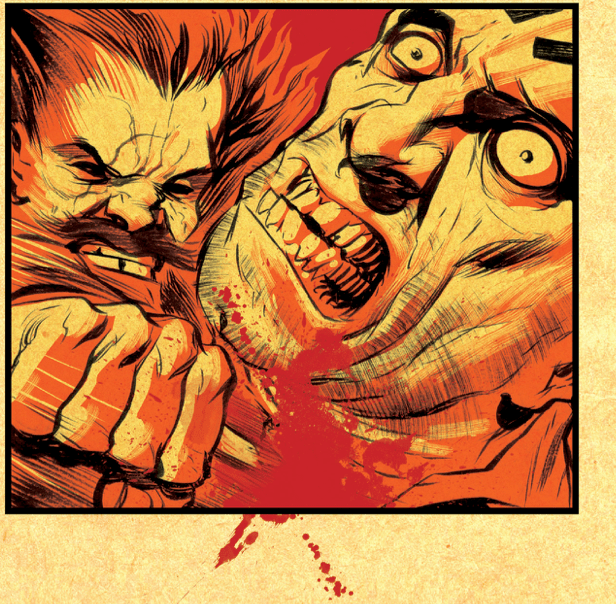 The artwork here is vibrant and expertly penciled, at times verging on the stuff of nightmares. It’s reminiscent of artist Eric Powell’s earlier work in the series The Goon—you can really feel every hit as Big Man is both literally and figuratively beaten down by the people and circumstances surrounding him. The grist mill of life slowly turns him from a kind-hearted and somewhat innocent child into a battle-hardened, world-weary Little Engine That Could. The illustrations look withered, aged, and nicotine stained, yet at the same time they burn with the smoldering heat of a lit cigarette. Big Man Plans is rated M for Mature, and with good reason. It contains adult language and sexual content as well as gruesome depictions of physical violence and torture. Despite this, I can’t wait to read the next issue, which will be the last of the four, when it’s released next month. In a way, I will be sad the series’ short run is over. It isn’t very often a book comes along that is so visceral, engrossing, and sympathetic all at the same time. This comic deals frankly and directly with the issue of dwarfism, yet it never feels like it demeans the antihero at its center. The writers treat their main character like any other human being, in a matter-of-fact way—which makes the somewhat exploitative nature of its storyline seem plausible. If you don’t mind a good dose of grit with your drama, then these may be the comic books for you. When he’s not troubleshooting or fixing computers and every other electronic device known to man, Tim Iverson can be found at the nearest local cineplex, sci-fi convention, comic book store, or trapped in front of some old skool video game.